Temple University Press, 9781439903353, 216pp. Susan Herbst is Professor of Public Policy at Georgia Tech, and Chief Academic Officer of The University System of Georgia. She is author of many books and articles on American politics including Numbered Voices: How Opinion Polling Has Shaped American Politics, Politics at the Margin, and Reading Public Opinion: Political Actors View the Democratic Process. Previously, she was acting president and Provost of the State University of New York at Albany, Dean of the College of Liberal Arts at Temple University, and Chair of the Department of Political Science at Northwestern University. 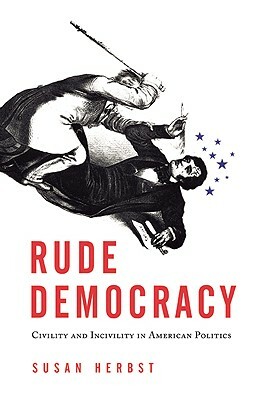 "Rude Democracy is must reading for anyone trying to make sense of the current incivility in partisan politics and its implications for democracy in the United States. Herbst offers a fresh perspective that lays out the downside of incivility but also shows that there are opportunities to use it to move policy debates forward in a positive way that will benefit citizenship and democratic politics. The book provides a starting point for those seeking to do this." "Susan Herbst's keen analysis of political rhetoric during the Obama years defuses prevailing alarmist warnings about the grim consequences of heated dialogue. She presents persuasive arguments that demonstrate the usefulness of civility while still acknowledging its serious drawbacks. Rude Democracy also features important proposals for improving the U.S. political climate. It deserves wide attention from political leaders, their staffs, and their publics." "Rude Democracy is a smart and thoughtful discussion of a thorny problem. Herbst's focus on the ‘strategic’ uses of civility and incivility makes good theoretical and empirical sense. Further, her call for educating Americans about how to debate is worthy and something she may well be able to implement. That Herbst does not add to the many shrill claims that civility is on the decline is refreshing. Her book is not trying to put old wine in a new bottle. Instead, she gets people to think about this topic in new ways. Herbst's engaging conclusion provides a compelling capstone to the general argument. In short, I am a fan of this book. Herbst’s voice will become a valued one in this important debate."